Plinker Ammo will contain mixed bullet weights. There is no set amount for each one, this is a mixed bag for plinking / target practice not match shooting. We offer super savings on ammo. All ammo functions perfectly, but may have cosmetic blemishes such as brass staining or small dings. 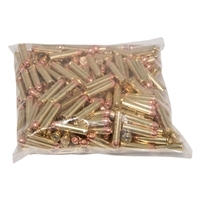 By offering this type of ammo, we pass the savings on to our customers at a huge discount. Some items may be sold in bulk packaging. It is YOUR obligation to know all laws regarding offers to sell and the sale and transfer of ammunition and to fully comply with such laws. The above list may not reflect every restricted city or county. We are sorry for the inconvenience.